The AcoustiDoor™ is a retractable sound-blocking panel that hangs over any door frame inside your house to reduce noise between rooms. Each AcoustiDoor™ is beautifully hand-crafted and customized to fit the dimensions of your door. Premium Fabrics may take an additional 2-3 business days to ship. 1. Measure your door opening (width and height). 2. Add 8" to the width and 4" to the height - the curtain will overlap each side by 4". This overlap ensures a snug fit without allowing sound to slip around the edges. NOTE: If your door opens inward, add an additional 9" to the height so that the door may swing open below the rolled AcoustiDoor. 3. The final dimensions are where your door curtain will contact your wall or door frame. Select whatever final dimensions you would like, making sure it is sufficient to overlap the top, bottom, and sides. What is the AcoustiDoor™ Sound Panel? The AcoustiDoor™ is a Door Sound Panel supported by grommets at the top, and industrial hangers that can be nailed in to the top of your frame or the wall. We have designed the hooks to make a minimum impact to your wall or frame. These come included with your order. The AcoustiDoor™ is held snugly against your walls with hook and loop fastener, also provided, to ensure sound does not seep around the edges into your living space. It takes less than 5 minutes to hang up, and can be retracted with sewn-in straps when you want to open your space. How does it work to block sounds? While most sound-blocking curtains merely absorb sound, the patented AcoustiDoor™ actually deflects sound waves, directing them away from your living environment. 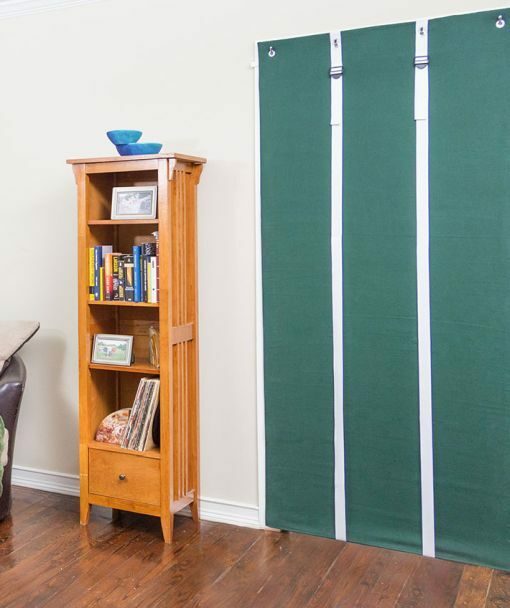 This sound deflection makes the AcoustiDoor™ the most effective sound-blocking curtain on the market.In order to block the sound, the door uses a dense, sound-blocking core, and averages between 10-15 pounds, although much smaller and larger doors may vary. How much sound does it block? The AcoustiDoor™ blocks most outside noise, dramatically transforming your home’s atmosphere. The interior core is designed to attenuate (block) 30 dB of sound, which translates to approximately 87% of sound, depending on what the sound source is (deep, rumbling sounds are more difficult to block). To see just how much sound the AcoustiDoor™ blocks, check out this handy infographic. How does AcoustiDoor attach to my wall? The AcoustiDoor™ is supported by grommets at the top, and comes with industrial hangers that can be nailed into the top of your door frame or your wall. We have designed the hooks to minimize impact to your wall or frame, making the AcoustiDoor™ ideal for apartment or rental homes. We also offer premium hooks, if you prefer a more refined look for the curtain. The AcoustiDoor™ is held snugly against your walls using sewn-on micro-Velcro to ensure that sound doesn’t seep around the edges and into your living space. It takes less than 5 minutes to install and can be retracted with sewn-in straps when you want to let in light, sound, and fresh air. Light-blocking: the AcoustiDoor™ Door Sound Panel blocks more than 99% of outside light. Many people purchase the AcoustiCurtain™ simply to use for its light-blocking properties. Thermal properties: the AcoustiDoor™ has insulating properties, lowering your home’s heating and cooling costs. Decor: available in a wide variety of colors, the AcoustiDoor™ pairs well with any living space. The AcoustiCurtain™ and AcoustiDoor™ ship within 5-10 business days, although we often are able to deliver them sooner. If you can’t wait, or just want to block out the noise now, consider our standard-sized AcoustiDoor™. We keep these sizes in stock and guarantee they’ll ship within 1-3 business days of your purchase. Wife is a light sleeper – this helped a bunch. Installed nicely, and now it’s up and works really well. Thank you for bringing soundproofing stop drafting peace to my household! Curtain is nice quality, some issues with shipping. I am very happy with my AcoustiDoor purchase from Residential Acoustics:Sound Proof Curtains! The waiting process was a little overwhelming after ordering, as it took almost 4 weeks to receive it, but it was worth the wait! The curtain is helpful in reducing outdoor noise as well as early morning light. It’s heavy, but the hooks provided make mounting straightforward. 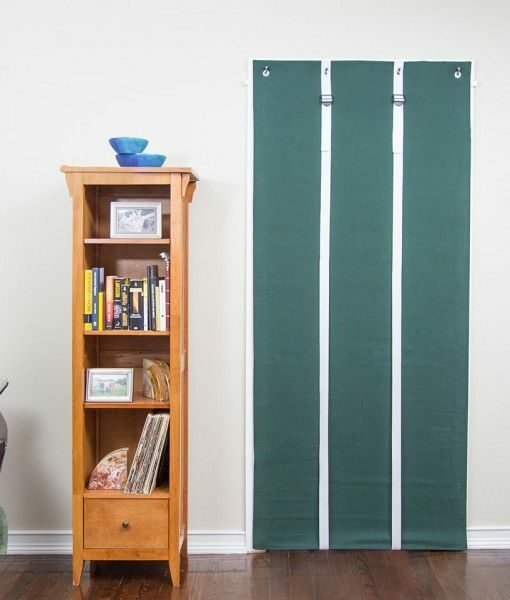 Raising the curtain is more work than a conventional curtain, but the straps work well. I’m a satisfied customer. Curtain is very heavy and it took a while to hang, but it really works. Measure very carefully. It took a little time to get responses from customer service, but they did respond every time.